Amazing how quickly days fly by, especially during the holidays. 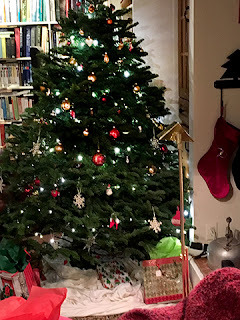 Had a great Christmastide with family, especially Sweetie, our daughter, and Straight Shooter, and with friends/family and with friends/neighbors and with friends/friends. Lots of baking and cooking and festivities. 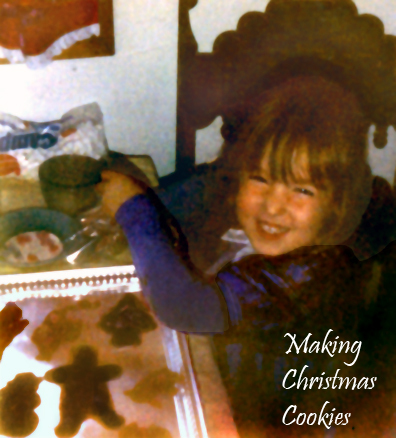 The photo above is of some of the Christmas cookies I baked. Katherine helped decorate the gingerbread ones, including the Ugly Christmas Sweater series she did. On this plate it's right in the middle, looking festive. 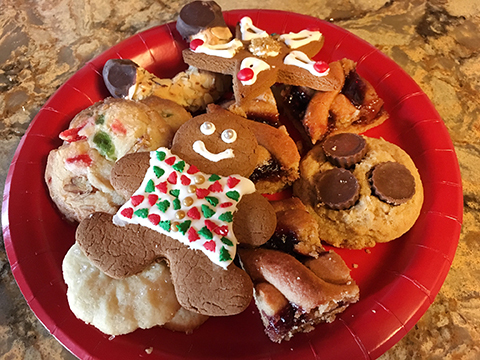 Actually one of the cookies (on the right with the mini peanut butter cups) isn't one of mine, but a regifting when I needed just one more cookie for the plate. The rest of the gifted cookies were delicious and quickly eaten. No recipe for that...sorry. 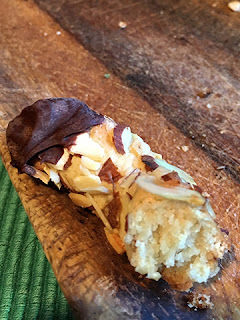 This is the only new cookie I made this year - Gluten Free Chocolate-Dipped Almond Crescents. Found the recipe in the newspaper and it uses almond paste and almonds and the ends get dipped in melted chocolate. Awesome and delicious. Here is a photo of the last piece! 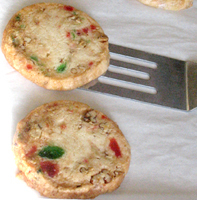 The whole cookie is shown on the cookie plate at the top. This recipe only makes 1 dozen cookies, which really isn't enough, so plan on making two batches once your friends and family get a taste. Recipe is below. Preheat the oven to 375 degrees F. Line a rimmed baking sheet with parchment paper. Place the sliced almonds into a shallow bowl and lightly crush them with your hand. In the bowl of a stand mixer fitted with the paddle attachment, beat together the almond paste, almond flour, sugar and salt on medium speed until the mixture becomes grainy, about 3 minutes. Add the egg white and beat until the mixture smooths out, about 2 minutes. Divide the dough into 12 equal pieces, each about 1 oz. Roll each piece into a log that is about 4 inches long. Roll the logs into the crushed sliced almonds, then place on the prepared baking sheet, forming each piece into a U shape. Space the cookies apart on the baking sheet. Bake until golden brown, about 15 minutes, checking at about 12 minutes to make sure nuts are not getting too browned. If they are, place a sheet of aluminum foil loosely over the cookies. Let cool on the pan for about 5 minutes then transfer to a rack and let cool completely. Melt the bittersweet chocolate chips (in the microwave or the top of a double boiler with the bottom simmering with a small amount of boiling water) and stir until smooth. Dip the ends or the base of the cooled cookies into the chocolate. Let dry on parchment or waxed paper. Store in an airtight container. 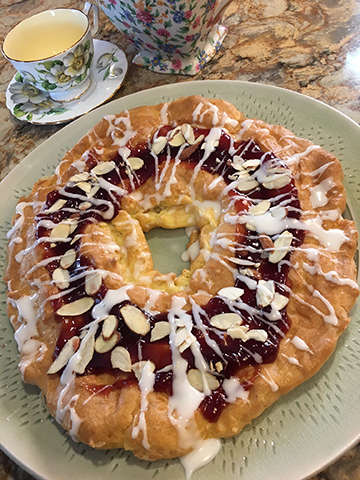 For years we would buy an Entenmann's Raspberry Danish to serve on Christmas along with our fruit salad, scrambled eggs and bacon. Then they stopped making that pastry (or stopped selling it here...not sure which) and I had to figure out a substitute. Until a few years ago the search was unsuccessful. Pastries from other sources were just not good enough and my attempt at making one was also less than successful. 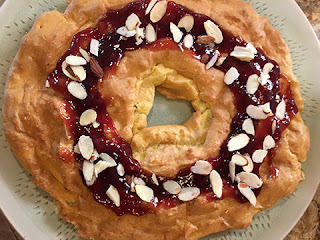 Two years ago I saw that King Arthur Flour website had a recipe for a Pecan and caramel Kringle that sounded delicious and I decided to see if I could adapt it to make a Raspberry and Almond version. It was good, so last year I repeated it but baked it on Christmas morning...not so successful because I was distracted. 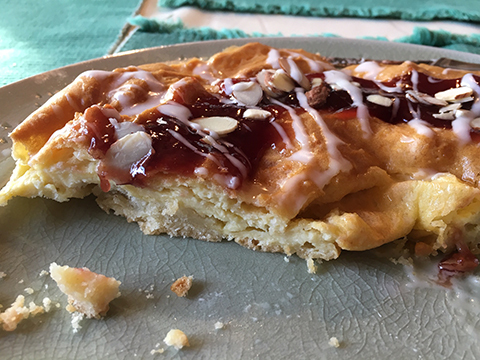 This year I baked it on Christmas Eve in the evening and then let it sit in the microwave overnight, then finished the raspberry jam, toasted almond slices and lemon glaze in the morning. It was exceptional! Pastry on the bottom, a hidden bit of almond paste gave a great almond flavor and additional texture, then puff pastry on top puffed up in the oven but sank overnight which made it easy to spoon on raspberry jam and spread it out, then top with the almond, then drizzle with the glaze. The hint of lemon in the glaze went so well with the other flavors. 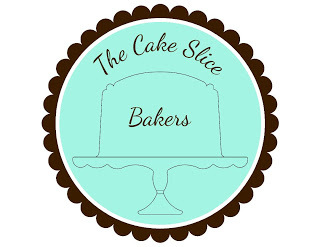 I highly recommend this pastry! Don't wait for next Christmas...invent an excuse to bake it. There are six parts to this pastry, but each is easy, so relax and take them one at a time. First you make the pastry bottom. Cut or rub the cold butter or margarine into the flour mixture just like for pie crust, then sprinkle the water in a little at a time, as you should do for pie crust. Gather the moist bits together and shape with wet hand into a ring on the prepared sheet pan or pizza pan. Secondly you create a rope of almond paste by rolling it with your hands into a rope on a surface lightly dusted with confectioners' sugar. The rope gets flattened a bit, then placed in the center of the pastry ring. The third part isn't difficult, but you need to have everything ready when you start. You will be making the same kind of dough used for cream puffs and eclairs. It starts out being cooked in a pot, then gets transferred to a bowl, where you beat in the eggs, one at a time, with a wooden spoon. 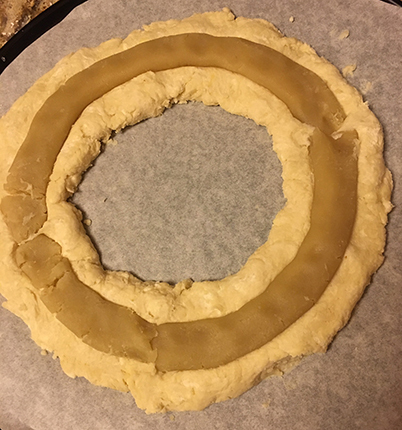 That mixture gets spooned and smoothed over the ring, completely enclosing it, and then all the components, now joined, get baked until medium golden brown like the photo above (although this photo above shows a kringle that has cooled and deflated a bit). At this point you can put the pastry aside as I did, or you can let it cool and then put on the jam, almonds and glaze. The kringle with jam and almonds is shown below and the finished kringle at the top. Have fun with it! You can change the kind of jam and it will still be delicious! Preheat the oven to 350°F. Lightly grease (or line with parchment) a baking sheet that's at least 18" x 13"; or a 14" round pizza pan. To make the base: Combine the margarine, flour, sugar and salt, mixing until crumbly. I used a pastry blender to cut the fat into the flour mixture. Add the water, and stir to make a soft, sticky dough. I used a fork and added the water slowly as I do for pie crust. Wet your hands, pick up the dough, and shape it into a 12" x 8" oval ring on the sheet pan; or a 10" ring in the pizza pan. This will be messy going, but just keep wetting your fingers and pushing it into a ring. An easy way to approach this is to first divide the dough into four pieces; roll each piece into a 9" rope, then connect the ropes and shape them into a ring. Once you've made the ring, flatten the dough so it's about 1 1/2" wide; basically, it'll look like a train or NASCAR track. Make a thin rope out of the almond paste and put it over the dough, connecting the ends so that the whole 'track' has a ring of almond paste in the middle of the track. 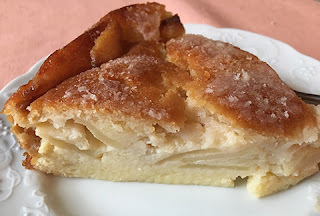 To make the pastry topping: Place the water, margarine, and salt in a saucepan, and heat over medium heat until the margarine is melted and the mixture is boiling. Immediately add the flour, stirring with a spatula until the mixture is cohesive and starts to form a ball. Transfer the batter to a mixing bowl. Beat in the eggs one at a time, making sure each is fully incorporated before adding the next. Add the almond extract at the end. Spread the pastry along the ring, covering it and the almond paste completely; you'll now have a much wider ring, though it won't be completely closed in the center; it should still look like a ring. Bake the kringle for 50 to 60 minutes, until it's a deep golden brown. When the kringle is done, remove it from the oven, and allow it to cool completely on the pan. To add the filling: First, have the sliced almonds all ready beside the pan of kringle; you'll be sprinkling them atop the jam as soon as you put it on. 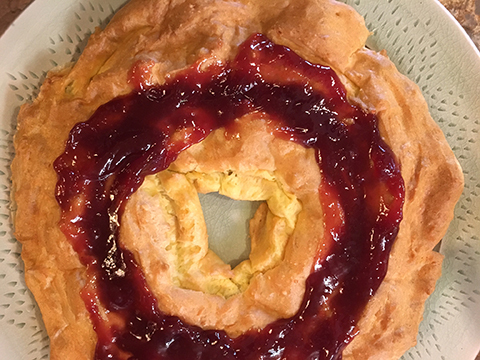 Stir the jam with a fork to break it up and then spread it over the kringle in a thin, even layer, mostly in the middle. Sprinkle sliced almonds atop the raspberry jam, pressing them in gently. Allow the kringle to cool completely. To make the glaze: Stir together the confectioners' sugar, salt, flavor almond extract and enough soy milk to make a pourable glaze. Drizzle it over the kringle. To serve, cut the kringle in 2" slices. If you prefer, you can bake the base, almond paste and cooked dough topping the day before serving, then wrap well and let sit on the counter overnight. In the morning add the jam and glaze. Wishing you, dear reader, a very merry Christmas and a most happy holiday season! We also wrapped a few packages (but not enough- more to wrap tomorrow morning...the advantage of only having adults for Christmas), had some lovely soup for dinner along with fresh green beans, put away all the Christmas decoration boxes until Epiphany, arranged the nativity scene on the hutch, and finished up with me baking a kringle for tomorrow's breakfast. A fun and festive day but a tiring one. Christmas Day this year will be very laid back! Do you have Christmas traditions you'd like to share in the comments? I'm supposed to have a different title for the post, one which includes the name of the cake I baked, but this month I'm not able to because I baked two different cakes from our 2018 book, The Perfect Cake. In December we get to choose from the whole book. Turns out that I needed a cake for two parties so I baked two cakes! One was so good that I'll be making it again for Christmas with family. The other was spectacular looking, but wasn't as delicious. It's still a good chocolate cake, just not a great one. 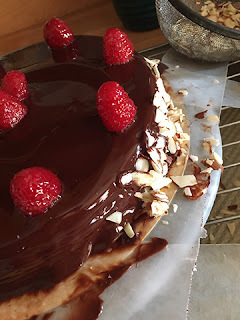 It didn't really have a strong chocolate flavor despite the fact that I used a large quantity of chocolate for both the cake and the ganache icing. Sweetie said that I've baked better and that's what I was feeling, too. 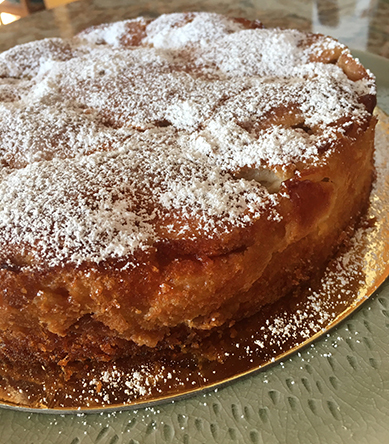 The first cake, the one that looked a little rustic but which everyone loved, is French Apple Cake on Pg. 182. It's pictured above and at the top of the post. Look at those thin apple slices interlaced with the custard. See how appealing the golden top crust with sugar is? I used Granny Smith apples, just as required, some rum instead of Calvados, but otherwise followed the recipe exactly. This cake is very moist with an apple and custard base and a bit of sponge cake on top. You get those two textures by taking some of the batter and setting it aside before adding the apples and egg yolks to the larger amount. The apples have been briefly microwaved first so that they are a lovely soft but firm texture when baked instead of crisp as they might be if not microwaved. The remaining batter gets some extra flour which seems to lighten it. The top gets nice and golden brown, too. That might be because of the sugar sprinkled on. 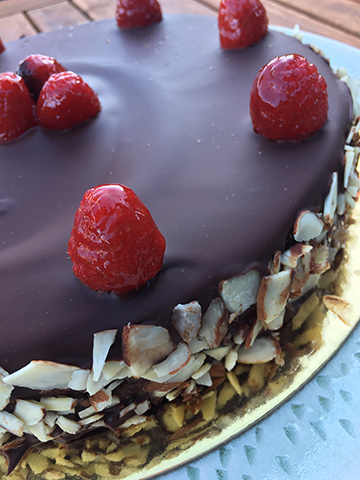 All in all, a really delicious cake with great textural contrast. 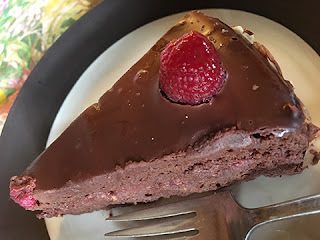 The second one, which is the Chocolate-Raspberry Torte, is similar to a flourless chocolate cake, but it does have ground almonds and a bit of flour. It's very lovely to look at but disappointing when eaten. Even with a full 8 oz of best quality bittersweet chocolate and another 5 oz for the glaze, the chocolate flavor wasn't strong. I did use the called for amount of espresso powder, too. The other problem was the filling. 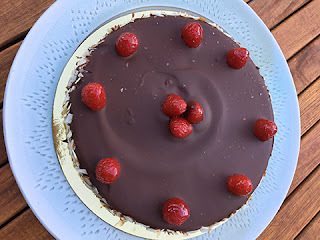 By combining uncooked, crushed raspberries and raspberry jam, the filling was very liquid and it tended to squish out when I was cutting the cake. It did add a nice sharp note to a pretty heavy, uninspired chocolate cake. This cake looked really pretty, but left something to be desired in the taste. In case you want those glazed raspberries on your next cake, just melt a small amount of the raspberry jam in a small bowl (I used the microwave), then paint each berry with the glaze. This way you'll get the jam glaze on the berries, but not the ganache glaze. The toasted almonds on the side are fiddly, but look so professional. Just remember to put the sifted nuts in a small bowl to work from. I kept them in the strainer and then proceeded to sift tiny bits of nuts onto my beautiful smooth glaze as I patted the nuts onto the sides! Fortunately it still looked great, just not perfect. Perfect is overrated anyway. No recipes, as usual, since the America's Test Kitchen folks asked us not to post any. 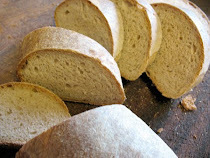 Every month on the 16th the Bread Baking Babes bake a different bread for your enjoyment. 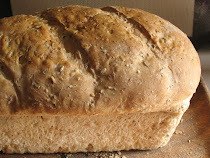 This month I'm the Kitchen of the Month, which means that I was able to choose the bread we bake. December is always a busy month, so I chose something that is tasty but not too time-consuming. When I saw this recipe for baked currant donuts in the Food and Wine seasonal magazine it seemed like it fit the bill. I love anything with currants and this donut is baked! It's from a yeast dough, so you do need to allow time for rising, but hands-on time is pretty brief. I have never made baked yeasted doughnuts so that was a big part of the appeal. With the granulated sugar coating they also look sort of chilly or covered with frost...seasonal. 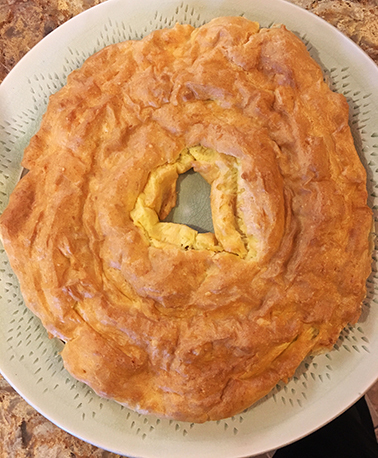 This is an enriched dough with butter, eggs, and milk so they are quite delicious and rich, which is perfect for a celebratory time of year. 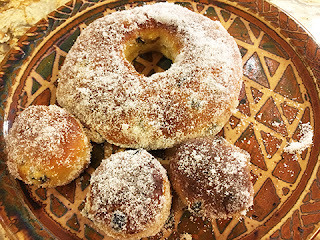 You can use a different dried fruit instead of or in addition to currants, you can play around with the flour and how you treat them once they are baked, but do make them as baked donuts, preferably with holes. I made them over two days, mostly to fit in with my busy schedule. Holding the dough overnight after the first rise didn't seem to harm it at all, nor did it make it more sour since it was only for about 12 hours. I found the dough to be just a bit too hydrated, so I added about a half cup additional all-purpose flour. Of course I didn't use butter, either, so my margarine could have had more water in it than real butter. Allow plenty of time for making the dough, especially when it's time to add the walnut sized pieces of butter...it takes a while on low speed to incorporate those pieces. Rising time is a little over three hours, too. If you do as a traditional baker does and begin at 3 or 4 am these could be ready by breakfast! These make soft, tender doughnuts with just a touch of spice. The currants and spices remind me of hot cross buns, but the texture is very different than the ones I've made...much more tender with a fairly open crumb. Hope that you enjoy these between now and December 29th...which will get here sooner than you think. If you do, send me an email at plachman at sonic dot net along with a photo and your baking experience and I'll include you in the Buddy post, plus send you a gorgeous Buddy Badge designed by Elizabeth. 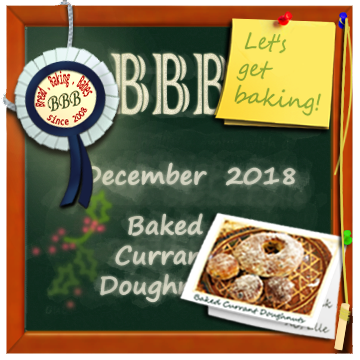 Do check out the donuts of my sister Bread Baking Babes, too! Meanwhile, in a small bowl, stir yeast with 2 tablespoons warm water and a pinch of sugar and let stand until foamy, 5 minutes. In bowl of a stand mixer fitted with dough hook, combine flour, nutmeg, and cinnamon with 1/4 cup of sugar. 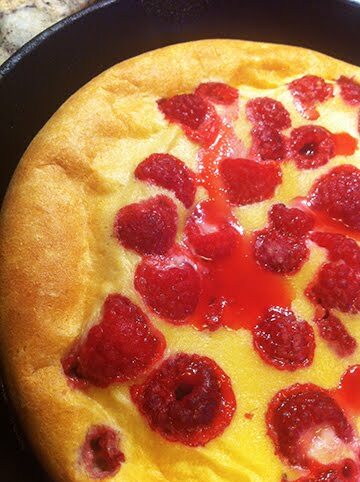 Add milk, egg, egg yolk and half of softened butter; beat at low speed for 3 minutes. Beat in yeast mixture, then add salt. Beat dough at medium speed until soft and silky, about 8 minutes; the dough should pull cleanly away from bowl. With machine on, add remaining softened butter to dough in walnut-sized lumps, beating at low speed between additions until incorporated. Drain currents, pressing out any excess water. Add to dough and beat in at low speed. Transfer dough to a greased bowl, turn to coat dough with grease. Cover and let stand in a warm place until doubled in bulk, 1 hour. Punch dough down, form into a ball, and return to bowl. Cover and let stand until billowy, 1 hour. Grease two large baking sheets. (Or line with parchment or foil.) Turn dough out onto lightly floured work surface & cut it into 12 equal pieces. Pinch each piece into a ball and arrange six balls on each prepared baking sheet, smooth side up. Cover with plastic wrap and let stand for 10 minutes. Using lightly floured hands, press each ball into a flat 4-inch disc. Using a 1 1/4-inch round cutter stamp out center of each disc. Return holes to baking sheets. There will be six donuts and six donut holes on each sheet. Cover loosely with plastic wrap and let stand for 1 hour, until risen slightly. Preheat oven to 400 degrees F. Position racks in upper and lower thirds. Bake donuts and holes for 25 minutes, shifting pans from top to bottom and front to back halfway through baking time. Donuts are done when they are golden and puffy and when the internal temperature at thickest part registers 200 degrees F.
Spread sugar in a shallow bowl. 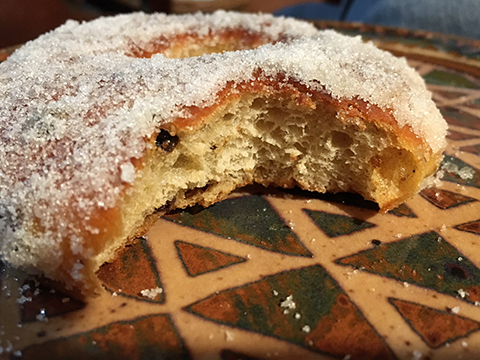 Brush hot donuts and holes on both sides with melted butter and dredge them in sugar. Transfer to a serving dish and serve at once. I'm thinking that 6gm or 7.5gm makes the most sense for a 1.6%-2% Baker's percentage of salt. I'll probably use 8gm if I up the amount of flour the way that Elle did. Yesterday I received a lovely letter from a niece and in it she asked about Christmas cookies I might recommend. I was touched that she would ask. Today I sent her a few links and it occured to me that you, my dear readers, might want some suggestions, too. If you read this blog on your phone or tablet you may never see the side bars. 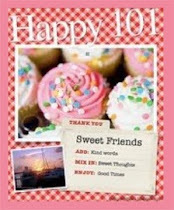 These include the calendar with direct links to past posts and more, but my favorite is the link to my recipe index. Unfortunately I haven't kept this up to date, but there are still hundreds of great recipes, organized by type. To get to web wies, scroll down to the bottom and click on Web View. That should take you to the view that has side bars. In web view, to the right, near the top, there is a photo of a set table with rust colored table cloth. If you click on that it takes you to a recipe index. Scroll down to cookies and have fun seeing what interests you. My two favorite cookies for Christmas are Santa's Whiskers which is a refrigerator cookie shaped in a log, chilled, sliced and baked. 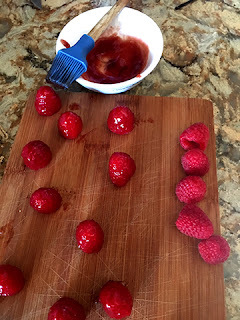 The nice thing is that you can leave the log in the fridge or freezer and slice and bake as needed, plus it has seasonal colors and is delicious. The second is for a rolled gingerbread cookie that you cut out, bake and decorate. Usually rolled cookies are tricky but this dough works easily and the cookies have just the right amount of seasonal spice. 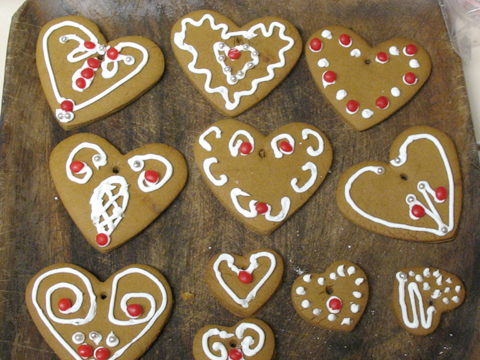 You can use purchased icing to decorate or make Royal icing yourself. Katherine and I enjoy being creative with icing and sprinkles and last year (I think) she also purchased a powder that gives a metallic glow. This is a long standing tradition, as you can see from the first photo. I make them without having the log rolled in coconut (the whiskers) because not everyone here likes coconut. To do the whiskers, just roll the fresh log of dough in dry coconut (can be found at health food stores & many groceries) or shredded moist coconut. Wrap, refrigerate and proceed as usual. It really feels like the season has changed to winter now. We've been getting rain, which is such a great thing since I live where most of our rainfall for the whole year happens between October and March, with the majority of that between December and February...when things are 'normal'. Unfortunately things haven't been that way for most of the last six years, with too little rain most years, so rain is even more welcome when it comes. I spoke with my North Carolina sister Saturday... a belated birthday phone call...and they were expecting lots of snow that night and Sunday. Sure enough, I checked the news Sunday morning and they were calling it Snowmagedden. She stayed home by the fire and took it easy...a good plan. We are both missing our mother. The anniversary of her death comes up in a few days and we will toast Mom on Wednesday, and those doing the toast will include at least one other sibling, maybe more. She was an excellent Mom and, in later years, friend and she is always in my heart. As the weather has gotten colder I've been spending more time in the kitchen, too. The cooler weather makes me want to bake and cook. I've made pea soup and lamb shanks. Neither was different from the posts, so not including the recipe, just the link. The squash and sweet potato dish that accompanied the leftover lamb shanks is a different take on a favorite. 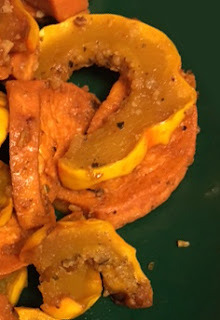 This time I didn't use butternut squash, just delicata squash and I used slices of peeled sweet potato to fill out the dish. The coating was different, too, with citrus peel and not very much cayenne pepper this time. It's a great dish with ham or chicken or turkey and it went well with the lamb shank, too. Although this dish is roasted, not baked, it still is done in the oven and so I decided that it fit well enough with my December Baking theme. The slices of sweet potato and squash should be about the same thickness. In a large plastic bag (I used clean produce bags from the market), combine the squash, olive oil, salt and pepper, maple syrup and dried peels and spices. Close bag tightly and shake to completely coat the squash with the wet ingredients and spices. Pour coated mixture on the parchment lined sheet pan and use the bag to spread the squash and potato slices out in the pan into a single layer. Bake in preheated oven for 15 minutes. 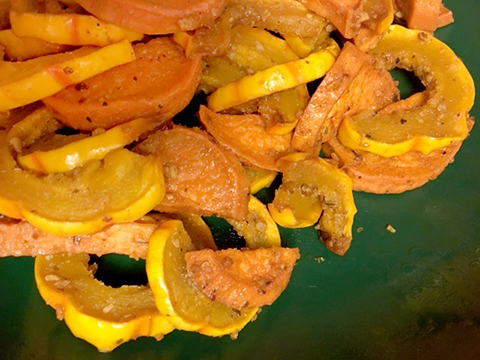 Use a spatula to turn the squash pieces over, then roast an additional 10 - 15 minutes until edges are browned and vegetables is softened. There is something about December that pushes me to bake. Although it's weeks away from Christmas, we have started into the holiday party season, plus I'm doing lunch with friends from time to time and want to have a little something sweet to give them. Then there are the occasions when my dairy allergy gets in the way and it's more comfortable to bring my own lunch instead of expecting the hostess to cook another entree just for me. The added bonus is that what I make is also available for another meal with Sweetie. Quiche is nothing new. I've probably posted two or three before this and each one is just a little different from the others. This time I was baking it to bring a slice to a meeting where quiche was on the menu. Unfortunately it was Costco quiche, which has milk and cheese in it. Mine was baked with no cheese and with unsweetened soy creamer in place of the milk, so it worked for my dietary needs. 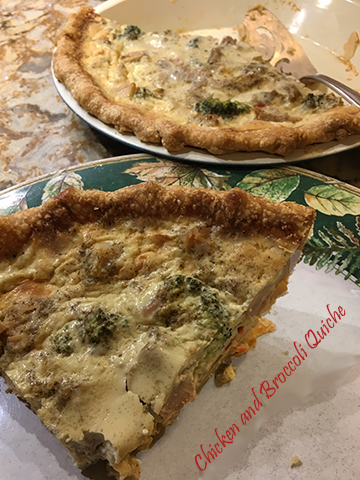 Quiche is really a versatile pie...you can put almost anything savory in it that works well with custard. Some classics include spinach and Swiss cheese with mushrooms and leeks like HERE, bacon and Swiss cheese, onion, mushroom and cheddar cheese, vegetables with onion and garlic and herbs, ham and cheddar, ham and chard and jack cheese, broccoli and blue cheese and bacon...you get the idea. Most do have cheese, but it really isn't necessary as long as you make sure that you have other ingredients included are that a good strong flavor. In some ways you can use things that you might include in an omelette. 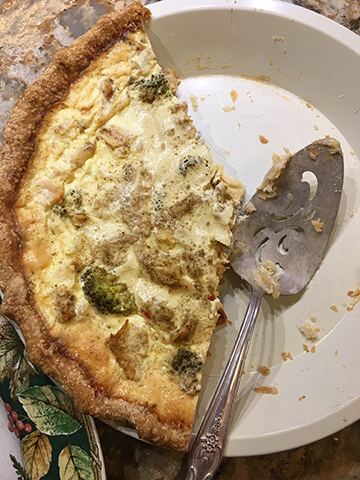 For this quiche we had onions and celery cooked in a little olive oil, broccoli, and small cubes of cooked chicken thigh. For seasonings we had poultry seasoning, salt and pepper, plus a little thyme. It was delicious and filling and very easy to make. Since I use the ready-made rounds of unbaked crusts found in the refrigerated section of our store (Pillsbury ReadyCrusts), it all goes together fairly quickly. You can also use your favorite pie dough recipe for the crust...it will probably be better, but not by much. This is a delicious version...packed with veggies and chicken with it all held together with a delicate and flavorful custard. It would be a handy thing to have in the fridge over the holidays, or perfect for your own dinner (or lunch) when you have had a busy day. Heat a large skillet and sauté’ the onion and celery until onion is translucent, about 4 minutes, stirring often. Cool. Spread the onion mixture over the bottom of the quiche crust. Arrange the chicken evenly over the vegetable mixture and then place the broccoli florets in a pattern over the chicken. In a medium bowl, whisk the eggs and milk together. Add the salt, pepper, and thyme and poultry seasoning. Pour this mixture slowly over the ingredients in the quiche crust. Place quiche in prepared oven and bake 20 – 25 minutes, or until just set and lightly browned on top. I used Pillsbury ReadyCrust. One round was fitted into a 9-inch pie pan, the edges were crimped, a round of parchment paper was put inside and dry beans were used as pie weights. Crust was baked in a 450 degree F. oven for about 10 minutes. Pie pan was put on a cooling rack, parchment and beans were removed, and crust was left to cool. Place all ingredients in a food processor and process until dough holds together and starts to forma a ball, about 25 seconds. Do not over mix. Remove dough and shape into a 6-inch disk. Wrap in plastic wrap and chill for at least 1 hour. Preheat the oven to 450 degrees F. Place disk on a lightly floured surface, and with a lightly floured rolling pin roll dough from the center out to the edges, changing the direction with each stroke, until the circle is 1/8 inch thick and about 1 inch larger than the pie plate. Fold dough in half and transfer to pie plate. Press gently to remove air bubbles. Fold edge under and flute. Do not prick dough for a quiche because the filling will seep under the shell. To partially bake the shell for a quiche, bake it for 8 minutes. Cool slightly on a rack. It should be slightly warm when filling is added. Sorry I've been away from my desk, but things have been busy. We've replaced some ancient shutters on the farmhouse and removed a door that was impacted by having shrubbery too close for years. A short term closing up with plywood was necessary since we're getting rain tonight and tomorrow, but soon there will be a new door...this is the farmhouse, too. 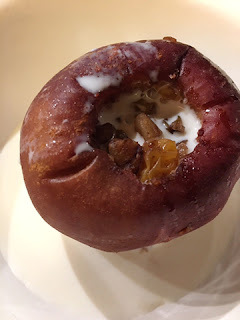 December started with with baked apples. I baked six of them, but they were small, so yesterday I baked six more. I'm using a nice dark red apple. I bought a bunch so can't remember the variety, but I think it is a Arkansas Black or similar heirloom. Nice, crisp apple with some tartness and good juiciness, plus it keeps it's shape pretty well when cooked. Unfortunately the skin gets a bit tough with cooking, but otherwise it's perfect for this recipe. When you bake these you first remove the stem end and the core area that holds the seeds, but you leave the bottom intact. That cavity formed by removing the core is filled with a cinnamon-sugar mixture, chopped walnuts, raisins, and a bit more cinnamon on top. With a little water in the baking dish, the apple goodness gets sealed in with aluminum foil and it's baked until the apples are tender. First of all, your house will smell wonderful with all that cinnamon perfuming the air. Secondly, this is a fairly healthy dessert or snack (or breakfast which is how Sweetie enjoyed one this morning) and it is enhanced by the addition of milk, cream, whipped cream, ice cream, or custard. Nut milk works, too. It's fine all by itself, but I think the dairy brings a lot to the party. It's quite delicious both warm and cold, especially if you like cinnamon. You can use your favorite apple. Just make sure that they fit snugly in the pan or dish you bake them in. The timing can vary, too, depending on the apple used. I recommend checking after a half hour and then every ten minutes after until a knife inserted goes in easily and you find the interior tender. 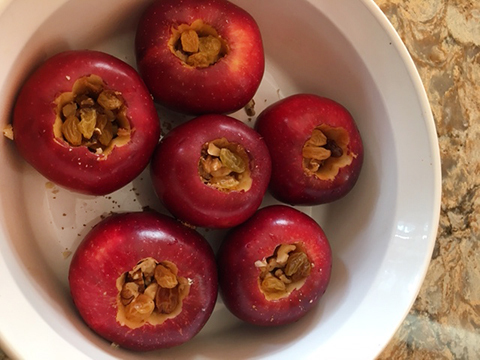 With a sharp paring knife, remove the stem end and core of each apple, making sure to remove all of the seeds. Be sure to leave the bottom 1/4 of the apple intact. Place the apples in the baking pan or dish. They should be very close to each other. If not, adjust pan size so that they are. You may have to switch to another pan or baking dish. Mix the sugar and 1/4 teaspoon cinnamon. You can shake it together in a jar with a lid or in a plastic bag with a zip lock. 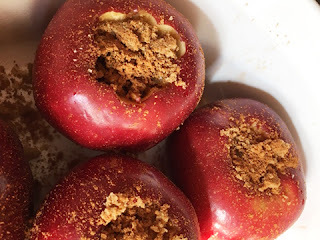 Divide the cinnamon sugar mixture among the apples in the pan or dish. Divide the chopped walnuts among the apples. Divide the raisins among the apples. 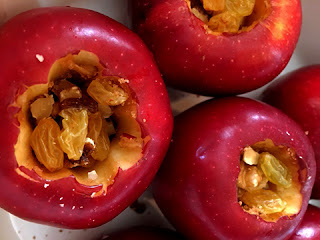 Sprinkle the remaining 1/4 teaspoon of cinnamon over the raisins, dividing it among the apples. Add the water and place foil over the baking pan or dish. Seal to the sides. Place in the preheated oven and bake for 30 minutes. Remove the foil and check for tenderness. If needed, replace the foil and bake another 10 minutes. Check for tenderness. If needed, replace the foil and bake another 10 minutes. Check for tenderness. When apples are tender, remove the foil and let cool slightly in the pan. Serve warm or cold, preferable with custard or cream or nut milk.